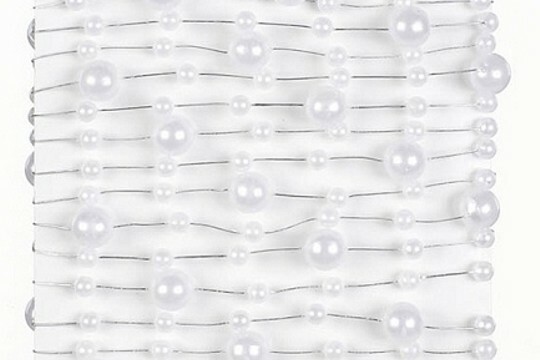 Oh, how we've fallen in love with this fun pearl wire. The bubbles are in two sizes (1/4 inch in diameter and 1/8 inch in diameter) are strung along a thin silver wire for you to use in any way you please. Originally meant for the floral industry, we think this would be great for shrines, for ornaments for many seasons and all kinds of other applications. From a close, but not complete, examination, it appears that there is one large bubble and then 3 small bubbles, followed by another large, and so on.... The bubbles are a shiny pearl white. It can imitate snow or just look pretty as is!